Germany is home to over four million Muslims, many of whom emigrated here from Islamic countries in recent decades. As their numbers have grown, the holy month of Ramadan has also found its way into everyday German life. Most believers continue to practice the traditions from their country of origin. The customs around Ramadan and the foods prepared during the holy month are as varied as the Muslims who have made Germany home. Celebrating Ramadan in Germany does present some shared experiences as well, both enjoyable encounters and some cultural and practical hurdles. For many Muslims, the fasting month of Ramadan is a very social time associated with a feeling of community and solidarity in a shared faith. For Amines Taşdan, a Muslim with Turkish roots who works in the Regional Office for Education, Integration and Democracy (RAA) in Berlin, this sense of community is particularly important. Fasting, she says, is a natural part of life in Muslim countries, but not in Germany. In majority Muslim countries, many of the faithful report a sense of euphoria brought on by fasting. “The feeling of fasting together and breaking your fast together as an entire community is more enjoyable than fasting as part of a minority in a predominantly Christian country. In Turkey, special cultural events are held during Ramadan and the mosques are extremely crowded for evening prayer. Here the mosques are often not even within walking distance.” Many Muslim institutions try to foster a sense of community in Germany in different ways, like inviting non-Muslim citizens to join in the celebration. Muslims in Germany want to pass the tradition of breaking fast with friends and relatives, of enjoying a shared meal and exchanging ideas, on to the next generation. 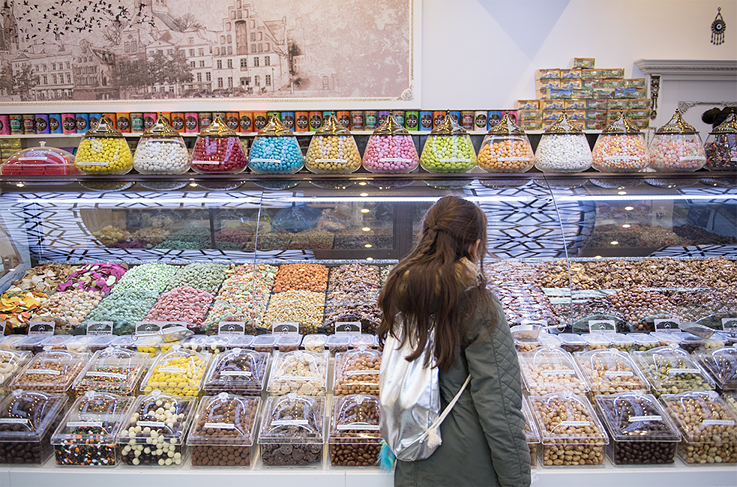 This isn’t a problem as far as food goes, as many Turkish, Arabic and Asian supermarkets, especially in the major German cities, offer shoppers typical local delicacies, like sweet Turkish baklava. Plenty of shops also sell foods that are “halal”, which translates roughly as “pure” or “permitted” in the Islamic faith. 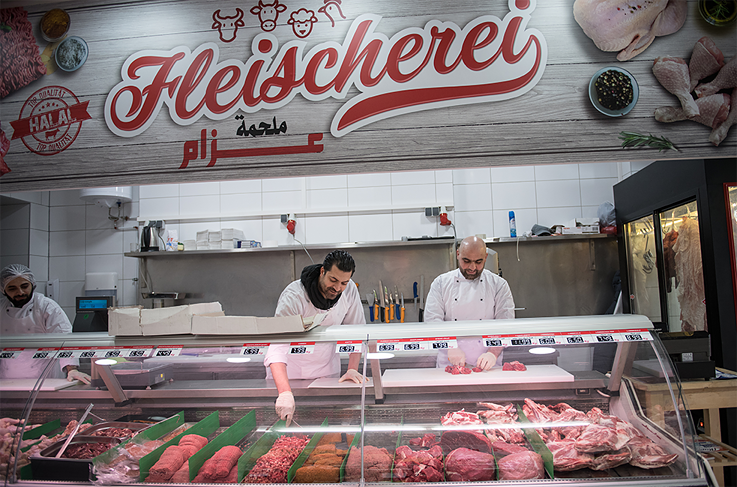 Halal meat has to be imported though, since Germany prohibits religious slaughter where the animals are not stunned. If Muslim cooks cannot find the exact ingredient they need at the supermarket, they may simply switch to German foods and dishes, so a Muslim family’s menu might feature German pumpkin or broccoli soup, for example. 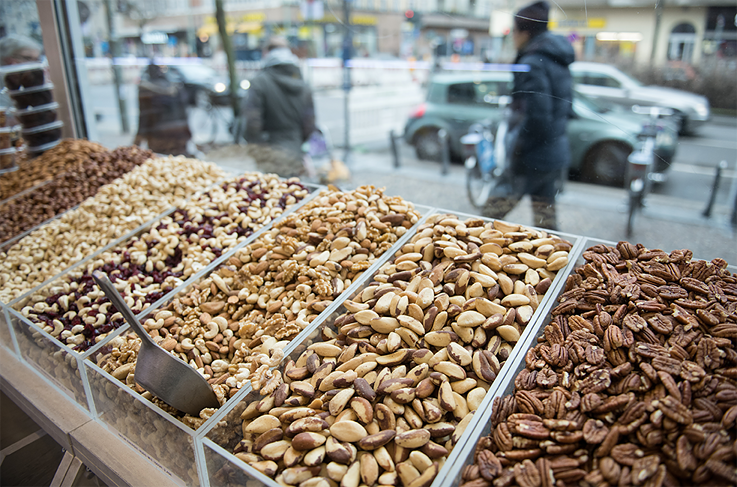 Berlin is home to a large and vibrant Muslim community, and practically every neighbourhood has shops that sell “typical Muslim” foods. 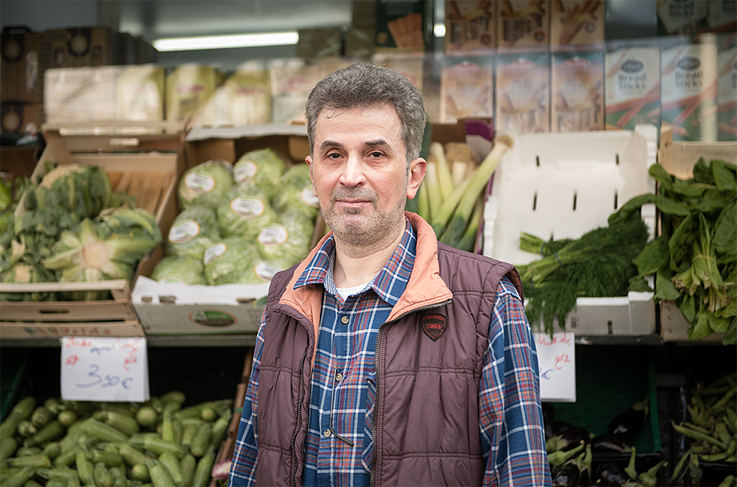 We asked shopkeepers and residents of the Kreuzberg and Neukölln boroughs what made Ramadan special and how it changed their daily business. 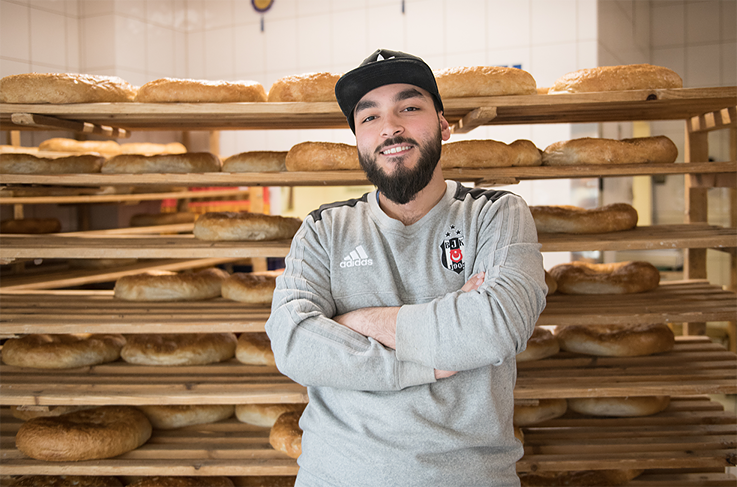 HAS Bakery, Şafak Yetim: We bake our special Ramadan bread during Ramadan. It is almost twice the size of our normal loaves and we add cumin to the usual sesame seeds. A long queue usually forms a few hours before sunset, just like in Turkey. We then sell bread for four hours straight. Şafak Yetim: The nicest thing about Ramadan is that you dine with a different family every day. Everyone sits together at one big table and the family serves their best dishes. Dinner usually starts with dates and a soup. In the morning we like to eat su böreği, a puff pastry stuffed with feta. Kugu Nut Roasters, Gül Tazegül: We usually sell more during Ramadan and dates and unsalted nuts are very popular. Eating salted nuts makes you really thirsty the next day, and of course you can’t drink any water during the day. Gül Tazegül: In our home, we cook more elaborate and filling meals during Ramadan. And we enjoy a lot of variety in what we eat. 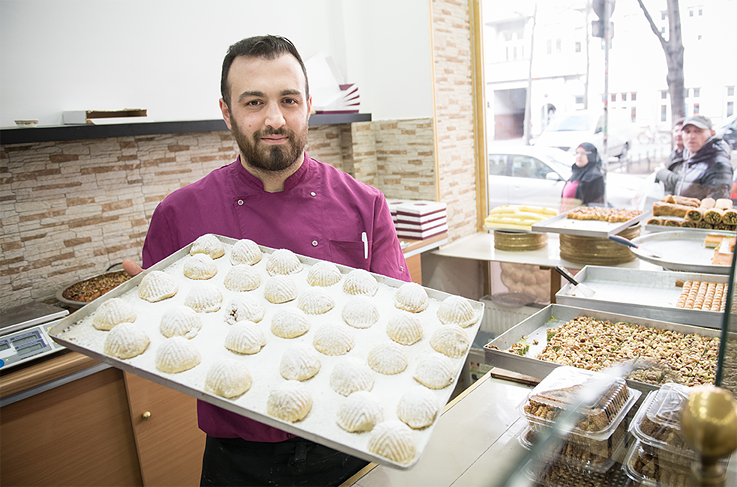 Umkalthum Pastry Shop, Mahmoud: During Ramadan we offer more variety. We sell richer pastries with dulce de leche or topped with baked cheese. Kunafe is very popular, which is a semolina pastry stuffed with Arab cheese and drizzled with syrup. Mahmoud: We don’t really cook anything special at home, but we do make more dishes than usual. We eat a lot of soups and salads, like tabbouleh (bulger salad with mint). We really enjoy drinks made with date syrup like jallab. What I like most about Ramadan is that people come together to eat and there is more variety in the foods. But the best part is that everyone is together. 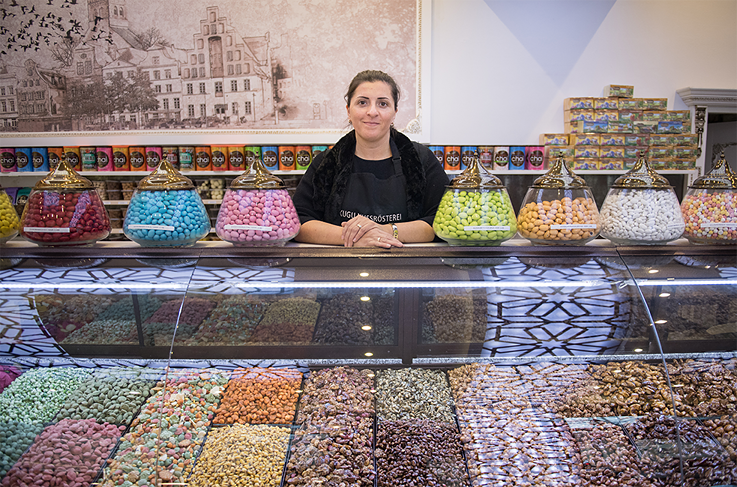 Azzam Grocery, Hassan, Mohammed and Mohannad: We carry more dates and liquorice during Ramadan. They are used to flavour drinks. People buy a lot of apricots for their morning drink, which keeps you from being as thirsty during the day. People make more soups and salads as well. Hassan, Mohammed and Mohannad: The best thing about Ramadan is all the visiting you do and that whole family comes together to eat and drink. So the atmosphere is really special and festive. 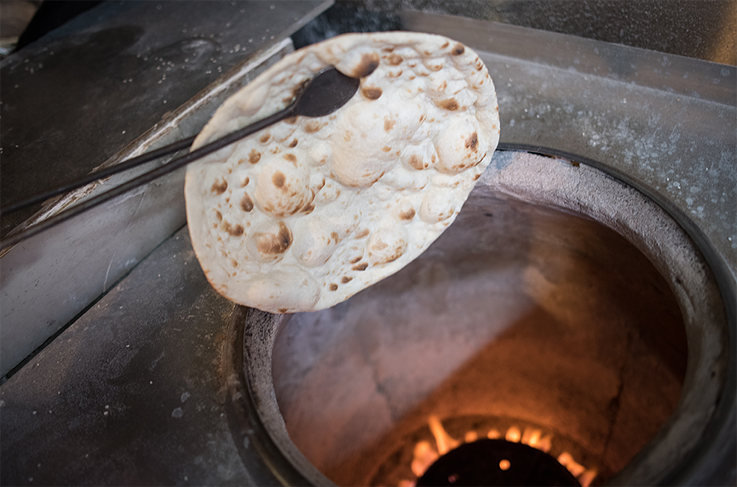 Dilan Flatbreads, Kamaran Shari: Not much changes for us during Ramadan. People just come in later, and there is a real rush for an hour or two. Some of our customers don’t fast or are not Muslims. Fasting can be especially taxing for many Muslims at work. Working hours are curtailed in many Muslim countries during Ramadan, where people clock out at 2 p.m. In Germany though, employees are usually expected to work regular hours. And the sun sets very late during the German summer, so if Ramadan falls in May or June, worshipers may have to wait until 9 in the evening to break their fast. As present as Ramadan may be in everyday life in Germany, many non-Muslims still have a lot of unanswered questions. They rarely ask about Muslim customs though, and often seem more concerned about why Muslims would voluntarily refrain from eating and drinking. The Muslim Juma project, whose name is an acronym of the German words for young, active, and Muslim, was founded to give young Muslims in Germany a voice. It asked users to post the questions non-Muslims pose about Ramadan from the funny to the downright strange on its website under the hashtag #nochnichtmalwasser (“no, not even water”). Around 4.7 million Muslims live in Germany. This corresponds to about 5 percent of the total population, making Muslims the largest religious minority in Germany. Almost half of them were born here. One in four of them will likely not have arrived in the country before 2011, due to the civil wars in the Middle East. With 17 percent, Muslims from the Middle East belong to the second-largest group of origin. Muslims who came to Germany in the 1960s in the course of the so-called "guest-worker migration" from Turkey - and the following generations - make up about half of the Muslims living in Germany. Most of them live in cities, fewer in the countryside. The regional distribution varies considerably: One third of them live in North Rhine-Westphalia, followed by Baden-Württemberg, Bavaria and Hesse. By contrast, hardly any Muslims are drawn to the new German states: only 1.5 percent of them live there. After Catholics and Protestants, Muslims are the third-largest religious community in Germany. A large proportion of practicing Muslims (61 percent) belong to Sunni Islam, followed by Alevites (8 percent) and Shiites (8 percent). In total, there are over 2,000 Muslim communities, more than three quarters of which belong to the Sunni faith. To be able to assess what role religion plays in their lives, the following questions were asked, among others: How strongly do you believe that God or something divine exists? How often do you think about religious questions? Or: How often do you perform personal - or obligatory prayers? The answers revealed that the religiosity of Muslims is "rather high". More than a third (39 percent) of those questioned regularly perform the five obligatory prayers and participate weekly in the Friday prayers at a mosque. Observing religious food and drink regulations is very important to many Muslims. According to Islamic understanding everything may be eaten that is not expressly forbidden. Simplified one speaks of “halal” (Arabic: permitted) and “haram” (forbidden). For example, according to the Koran pork is forbidden. Also, many Muslims do not drink alcohol. Another important pillar of Islam is the month of Ramadan. During this time between sunrise and sunset, believing Muslims refrain from drinking, eating and smoking, among other things. Ramadan ends after about one month with the festival Id al-Fitr. 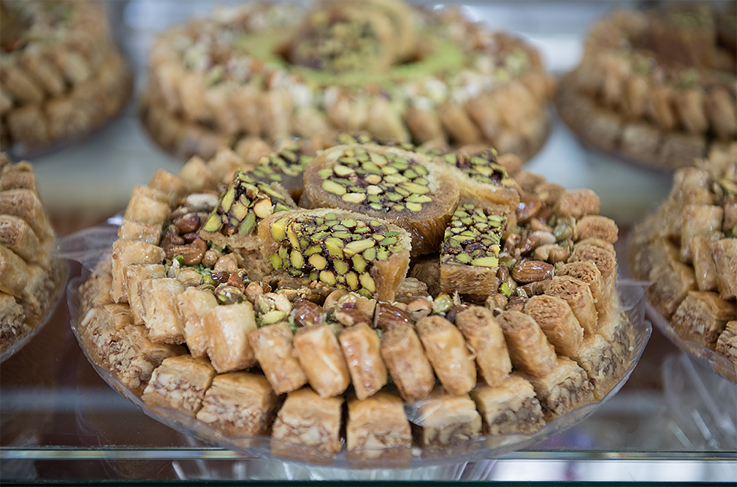 Because "Eid" is associated with lots of sweets, the three-day festival is also called the "Sugar Feast". Overall, the overwhelming majority (96 percent) of Muslims living here feel strongly connected with Germany. Every second Muslim now has a German passport. A large proportion of them are also committed to fundamental social values such as equality (83 percent). More than half agree with marriage for homosexual couples. Among highly religious Muslims, who rarely question their beliefs, about 40 percent do so. On a personal level, too, it is evident that Muslims have been well-received by society: More than three quarters of Muslims born in Germany regularly spend their leisure time with people who do not belong to their religion. Only a small proportion of the Muslims surveyed (8 percent) belong to a purely Muslim circle of friends and network. Many Muslims are mainly engaged in helping refugees: almost every second Muslim citizen is involved here - for instance in providing language courses, donating clothes or helping refugees navigate "Behördendeutsch" (German "officialese"). About three quarters of the children born in Germany to Muslim immigrants grew up with German as their first language. Among immigrant Muslims, the proportion of those who call German their first language is about one fifth. Thus a trend that language skills are improving with each generation can be seen. The day-care centre (“Kita”) is regarded as an important place for early childhood education, for example to learn the language. In general, the Muslim families surveyed are in favour of preschool childcare. Whether such an offer is taken up depends above all on the age of the child: Children under one year are cared for almost exclusively at home. From the age of three, the number of children attending a day-care centre increases significantly. Of the four- and five-year-olds, the figure is already more than 90 percent. Regarding Muslims' school careers, the following picture emerges: 36 percent of Muslim pupils leave school before the age of 17 - by comparison: In France, this figure is only about one in ten. The labour market presents the following picture: more than half of Muslims (approximately 60 percent) work full-time, one fifth part-time. This means that Muslims' participation in the labour market no longer differs from the national average for German employees. The unemployment rate is also adjusting. Among working Muslim women, 35 percent work full-time. However, this falls short of their expectations: almost half of them would like to work full-time. Highly religious Muslims in particular find it difficult to find a job that matches their qualifications. There are two possible reasons for this: religious Muslims often wear visible religious symbols and are thus confronted with reservations. In addition, religious duties in themselves - such as the five obligatory prayers - can be an obstacle to participation in working life. The data is based on the 2017 Bertelsmann study “Religionsmonitor” (Religion Monitor), which examines language competence, education, participation in working life and inter-religious contacts of Muslims in Western Europe. From Germany, 1000 Muslims with roots in Turkey, Southeast Europe, Iran, Southeast Asia, North Africa and the Middle East participated. In the other countries, some 500 Muslims from each of the most important countries of origin participated. Muslims in the sense of the study are persons who define themselves as belonging to Islam on the basis of their self-attribution. People who immigrated through the asylum system after 2010 were not interviewed. Text: Nadine Berghausen is an art historian and freelance copywriter and journalist. Photo story: Stefanie Loos is a freelance photographer and photojournalist in Berlin. Her work is primarily in portraits and documentaries, and she is a co-founder of the CommonLens photography agency.